Background Medial displacement calcaneal osteotomy is indicated in individuals with stage 2 posterior tibial tendon deficiency (PTTD) with a supple hindfoot and the absence of clinical or radiographic arthritis. Patients and methods This prospective study evaluated the effects of medial displacement calcaneal osteotomy and flexor digitorum longus transfer to navicular bone on pedal realignment and function in 14 patients (15 feet) with a stage 2 PTTD. Results American College of Foot and Ankle Surgeons scoring scale module number 3 was measured before the reconstruction and at latest follow-up, and also patients’ satisfaction were reported, demonstrating a good realignment in short-term follow-up (15–18 months). The American College of Foot and Ankle Surgeons score improved postoperatively from average of 53.5 to 87.4 without progression of arthritis at adjacent joints. Conclusion This simple surgical procedure has an excellent effect on realignment and function of PTTD stage 2 without marked forefoot abduction. Posterior tibial tendon deficiency (PTTD) is the commonest cause of adult-acquired flatfoot deformity. Johnson and Strom  classified PTT dysfunction in 1989 into three stages. The classification scheme helped in the diagnosis and treatment of PTTD. Dynamic, or flexible, flatfoot deformity with a flattened arch, forefoot abduction, and hindfoot valgus malalignment are considered stage II. Early attempts to directly repair the posterior tibial tendon have been unsatisfactory. Mehta et al. in 2013 described that the deformity occurs because of misalignment of the bones of the foot rather than any deformity of the individual bones, and that a normally shaped foot can be obtained by appropriately repositioning the bones. Surgical treatment in this stage involves reconstruction of the PTT, where flexor digitorum longus (FDL) tendon is the first option, combined with an osteotomy, such as medial displacement calcaneal osteotomy (MDCO) or a lateral column lengthening . The posterior calcaneal displacement osteotomy restores the gastrocnemius–soleus complex function as a heel invertor by displacing the insertion from lateral to medial relative to the subtalar joint axis . In this prospective study, 15 feet of 14 patients underwent MDCO for correction of stage 2 PTTD in the adult-acquired flatfoot. Clinical and radiographic analysis has been evaluated with an average follow-up of 15 months. This prospective study included 14 patients with 15 feet treated between 2008 and 2013; all cases underwent MDCO and FDL transfer to navicular bone because of stage 2 PTTD. The study was approved by the institutional ethics committee in Department of Orthopedic Surgery and Traumatology, Faculty of Medicine, El-Minia University, El-Minia, Egypt. There were five male and nine female patients. Age of patients ranges from 16 to 62 years, with mean age of 37 years. Right foot was involved in seven patients, left foot in six patients, and only one had bilateral involvement. Tendoachilles lengthening was done if residual equines after osteotomy and FDL transfer existed. Patients with other foot deformity, skin problems, previous foot or ankle corrective surgery or patients who had concomitant systemic or metabolic bone disease that might influence healing in osteotomy site were excluded. Evaluation was made according to American College of Foot and Ankle Surgeons (ACFAS) scoring scale  module number 3, and also patients’ satisfaction was recorded, with excellent and good results considered satisfactory results. Mean follow-up was 15 months (range: 12–18 months). After spinal anesthesia, patient is positioned in supine position with a sandbag under the affected limb. In all cases, a tourniquet was applied to the thigh. The foot is prepared and draped. An incision is made 2 cm below the tip of the fibula in line with the peroneal tendon. We try to perform the osteotomy parallel as possible to the axis of the subtalar joint. The cut is made perpendicular to the axis of the tuberosity at a 60° angle with respect to the sole of the foot. Upward translation is avoided. Once the calcaneus is held in the appropriate position, which is ∼10–12 mm of medial shift, it is fixed with one 7.3-mm cannulated screw introduced from inferolateral to anteromedial to enter the sustentacular bone. Compressing the overhanging osteotomy site is important because presence of a ridge can irritate the soft tissues and sural nerve  ([Figure 1]a–c). 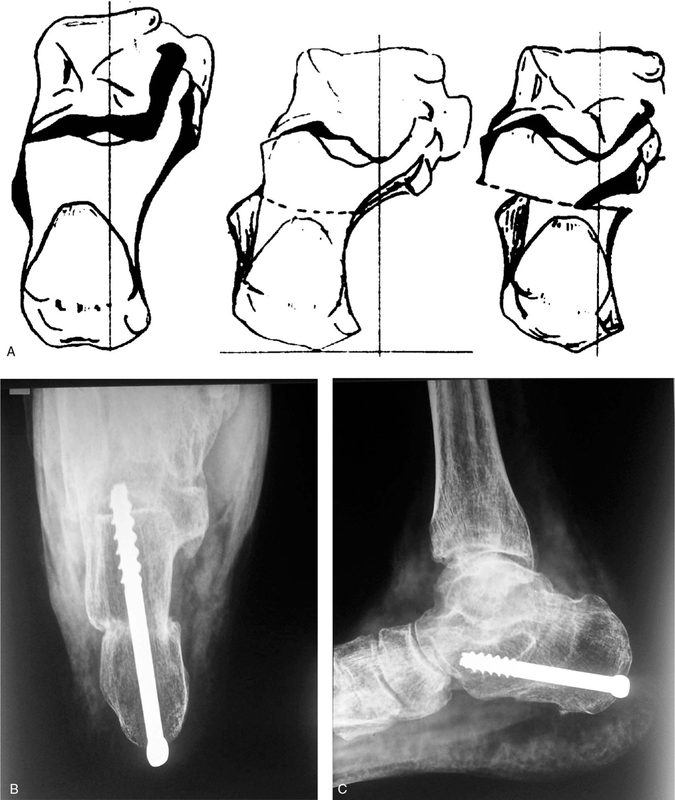 Figure 1 (a) Scheme of medial displacement calcaneal osteotomy , (b and c) radiography of calcaneal osteotomy. To adjust tension more accurately at the transferred tendon, repair of the tendon was done after the osteotomy. An incision is made medially starting behind the medial malleolus and extending distally toward the medial cuneiform. The spring ligament is explored, and repair of any tear was done using nonabsorbable sutures (Ethibond no. 2). Once the PTT tendon was evaluated as PTTD, hypertrophic synovitis was debrided. Frankly fibrotic tendinous tissues were resected distal 2 cm. If, however, there is insertional tendinopathy and the distal tendon is inflamed, it was completely removed from its attachment to the navicular. FDL tendon was harvested. The sheath of the FDL tendon must be released up to the master knot of Henry and the tendon is cut under direct vision with scissors. A suture is inserted into the distal part of the FDL tendon, and the tendon is then passed from plantar to dorsal through a 3.2-mm drill hole. FDL tendon is pulled through the hole and pulled up dorsally ([Figure 2]a and b). The tendon is tightened maximally to get an excursion of ∼1 cm. Position of the foot should be in inversion beyond the midline. Figure 2 (a and b) Intraoperative osteotomy and medial repair. For patients with residual equines after completion of the procedure, percutaneus tendoachilles lengthening was performed. Intravenous antibiotics were administered for 2 days followed by oral antibiotics for 10 days. Postoperative pain was controlled by simple analgesia. Posterior slap in inversion was applied for 2 weeks and then short leg cast for 4 weeks. Weight bearing is permitted after 4 weeks of the procedure as tolerated by the patient. Osteotomy healed approximately within 6 weeks, and then medial arch support was applied for 6 months after cast removal. Impact activities were avoided until 12 weeks postoperatively ([Figure 3]a and b). Figure 3 (a) Preoperative, (a and b) postoperative photographs. The ACFAS score improved postoperatively from average of 53.5 (range: 41–60) to 87.4 (range: 70–95) postoperatively. Score improved in all patients, even in the two (13.3%) patients with poor satisfaction. Of the 15 feet, two (13.3%) had pain and limitation of some activity postoperatively compared with 12 (80%) feet that had pain and significant limitation of activity preoperatively. Postoperative pain was caused by screw irritation. The appearance of foot improved in 14 (93.3%) feet. No patients used walking aids or special shoes postoperatively. Subtalar joint motion remained subtle and pain free in 14 (93.3%) feet. Seven patients (seven feet) (58.3%) could not perform single-limb-heel-rise test preoperatively, whereas postoperatively one patient (one foot) (8.3%) could not perform the test and one patient (one foot) performed the test with difficulty. One patient (one foot) (8.3%) postoperatively did not improve from limp owing to foot pain (without shoes). Anteroposterior talo-first metatarsal angle (APT1M) had been corrected from an average of 17.6° (minimum 5° and maximum 28°) preoperatively to 7.7° (minimum 3° and maximum 15°) postoperatively. Lateral talo-first metatarsal angle (LT1M) had been corrected from an average of 18.3° (minimum 8° and maximum 25°) preoperatively to 4.8° (minimum 0° and maximum 28°) postoperatively. Lateral calcaneal pitch angle had been corrected from an average of 8.75° (minimum 5° and maximum 12°) preoperatively to 15.2° (minimum 8° and maximum 18°) postoperatively. APT1M angle was corrected to normal average in six (40%) patients. LT1M angle was corrected to normal average in 14 (93.3%) patients. Calcaneal pitch angle was corrected to normal average in 14 (93.3%) patients. There were positive correlations between radiological parameters and ACFAS score. Complications include two (13.33%) feet developed sural neuritis, where one of them persisted and was treated by local injection of corticosteroid. One (6.7%) patient developed infection in the medial wound and was treated by debridement [Table 1]. Different calcaneal osteotomies have been used quite extensively for PTTD, most commonly Evans  lateral column lengthening (LCL) and Koutsogiannis  (MDCO) osteotomies. The Evans osteotomy is capable of reducing both the hindfoot valgus and the forefoot abduction ,. However, this procedure has been shown to increase calcaneocuboid joint pressures when used in adults . Phillips  found 15 of 23 Evans procedures to have minor secondary arthrosis in the calcaneocuboid joint at an average follow-up of 15 years. In the presence of severe forefoot abduction and hindfoot valgus, combination of MDCO with an Evans lateral column lengthening has been described . In MDCO, Achilles tendon insertion is displaced off from lateral to the subtalar joint axis to a more medial position increasing the supinatory action of the posterior muscle group, resulting in hindfoot inversion ,. In addition, the ground reactive forces at heel strike on medialized posterior calcaneus will create a supinatory moment of the hindfoot. As the hindfoot supinates, the medial longitudinal arch is supported and prevents midfoot collapse . Stability of the MDCO permits early weight bearing, and also it does not require bone grafting and therefore eliminates donor site morbidity and decreases postoperative convalescence relative to lateral column lengthening. Disadvantages of the MDCO include its limited ability to correct forefoot abduction. Patients with significant forefoot abduction may require a LCL or distraction arthrodesis of the calcaneocuboid joint to correct the forefoot abduction . Cadaveric studies have intimated that the MDCO may alter the distribution of contact stresses in the tibiotalar joint, which may ultimately predispose the ankle joint to degenerative changes ,. Many evaluation scores were developed for assessment of adult-acquired flatfoot; most of them were subjective like visual analog score, foot function index, and short form (SF 36) score. However, the ACFAS scoring scale module number 3 includes a total of 100 points (50 subjective and 50 objective). The subjective parameters are broken down into sections on pain, appearance, and functional capacities, whereas the objective parameters appear under the radiographic and function (musculoskeletal) sections . A total of 18 patients who underwent MDCO and FDL transfer for stage 2 PTTD were investigated radiographically by Myerson et al. . Criteria examined included the LT1M and APT1M view, the talonavicular coverage angle, and the medial cuneiform to floor distance. They concluded that the MDCO will protect FDL transfers by reducing the heel valgus and its antagonistic pronatory forces . The medial cuneiform to ground distance was not evaluated in the present study. Correction of the APT1M angle on the radiograph after MDCO may be because of the supinatory force of the Achilles tendon on the hindfoot. Uncovering of the talar head on an AP radiograph is often seen with hindfoot valgus. This is a result of the talus moving into a plantarflexed and adducted position. The talus cannot plantarflex and adduct when the subtalar joint is in a supinated position following MDCO. Catanzariti et al. in 2000 reviewed 24 feet that underwent MDCO, and the weight-bearing APT1M angle on the radiograph improved from a preoperative mean of 22.96° to a postoperative mean of 11.04° with a mean improvement of 11.92°. Correction of the hindfoot valgus similarly corrects the weight-bearing LT1M angle on the radiograph. A reduction of talar plantarflexion corrects the longitudinal arch and places less demand on the flexor tendon transfer. The correction in talar plantarflexion has been demonstrated radiographically. In Catanzariti et al. , the LT1M angle on the radiograph improved an average of 13.38°. In the current study, LT1M angle had been corrected from an average of 18.3° preoperatively to 4.8° postoperatively. The weight-bearing APT1M angle on the radiograph improved from a preoperative mean of 17.6° to a postoperative mean of 7.7° in the current study. The results of Myerson et al. were similar to these findings, with a mean improvement of the talo-first metatarsal angle of 12° on the AP radiograph . Comparing the radiological parameters of our study with previously mentioned studies shows that they have much higher preoperative and postoperative parameters with almost same range of correction which is explained by that MDCO osteotomy is not able to correct higher than this range. Among all patients analyzed in our study, 86.7% (13/15) of patients were satisfied with the procedure and would undergo the procedure again. We also observed a complication in the form of sural neuritis in two (13.3%) patients and wound infection in one (6.7%) patient. Postoperative complications appeared to play little role in the outcome. The presence of complications, such as sural neuritis, had no significant bearing on results. Patients reporting unfavorable outcomes were identified as having undercorrection. Statistical analysis of the radiographic data was performed. Statistically significant results were identified for both preoperative and postoperative radiographic findings of the APT1M and LT1M views and calcaneal pitch angle. Moreover, the ACFAS score improved postoperatively from average of 53.5 (range: 41–60) to 87.4 (range: 70–95). Patients can bear weight and return to normal activity in short time because of inherent stability of the osteotomy. However, the osteotomy has a limited ability to correct forefoot abduction. We are aware of the limitations of the assessments in this study. First is the small sample in the study and secondary the short-term follow-up period (15 months) in comparison with other studies, putting in mind that our study is a prospective one. The results of the present study demonstrated that a stage 2 PTTD should be treated according to the grade of deformity. In stage 2 when hindfoot valgus only exists, MDCO and FDL transfer gives excellent results with simple surgical procedure and short postoperative rehabilitation because of inherent stable osteotomy with low complication rate, but disadvantages of the MDCO include its inability to correct sever forefoot abduction. Combined osteotomies (MDCO and LCL) may be more able to correct hindfoot valgus and forefoot abduction. FDL transfer is better to be done after medial displacement of the calcaneus because the adjustment of tendon tension will be more accurate. Finally, there was good agreement between clinical and radiological results. Johnson KA, Strom DE Tibialis posterior tendon dysfunction. Clin Orthop 1989; 239:196–206. Mehta SK, Kellum RB, Robertson GH, Moore AR, Wingerter SA, Tarquinio TA. Radiographic correction of stage III posterior tibial tendon dysfunction with a modified triple arthrodesis. Foot Ankle Int 2013; 34:1355–63. doi: 10.1177/1071100713489285. Epub 2013 Jul 5. Choi K, Lee S, Otis JC, Deland JT. Anatomical reconstruction of the spring ligament using peroneus longus tendon graft. Foot Ankle Int 2003; 24:430–436. Marks RM. Posterior tibial tendon reconstruction with medial displacement calcaneal osteotomy. Foot Ankle Clin 1996; 1:295–313. Thomas JL, Christensen JC, Mendicino RW, Schuberth JM, Weil LS Sr, Zlotoff HJ et al. American College of Foot and Ankle Surgeons (ACFAS). ACFAS Scoring Scale user guide. J Foot Ankle Surg 2005; 44:316–335. Catanzariti AR, Lee MS, Mendicino RW. J Foot Ankle Surg 2000; 39:2–14. Evans D. Calcaneo-valgus deformity. J Bone Joint Surg 1975; 57-B:270. Koutsogiannis E. Treatment of mobile flat foot by displacement osteotomy of the calcaneus. J Bone Joint Surg 1971; 53-B:96–100. Brim SP, Hecker R. The Evans calcaneal osteotomy: postoperative care and an evaluation on metatarsus adductus angle. Foot Ankle Surg 1994; 33:2–5. Sangeorzan BJ, Mosca Y, Hansen ST. Effect of calcaneal lengthening on relationships among the hindfoot, midfoot, and forefoot. Foot Ankle 1993; 14:136–141. Cooper PS, Nowak MD, Shaer J. Calcaneocuboid joint pressures with lateral column lengthening (Evans) procedure. Foot Ankle Int 1997; 18:199–205. Phillips GE. A review of elongation of os calcis for flat feet. Bone Joint Surg 1983; 65-B:15–18. Frankel JP, Turf RM, Kuzmicki LM. Double calcaneal osteotomy in the treatment of posterior tibial tendon dysfunction. Foot Ankle Surg 1995; 34:254–261. Jacobs AM, Geistler P. Posterior calcaneal osteotomy: effect, technique, and indications. Clin Pod Med Surg 1991; 8:647–657. Steffensmeier S, Saltzman CL, Brown TD. Effects of medial and lateral displacement calcaneal osteotomies on tibiotalar joint contact stresses. J Orthop Res 1996; 14:980–985. Michelson JD, Mizel M, Jay P et al. Effect of medial displacement calcaneal osteotomy on ankle kinematics in a cadaver model. Foot Ankle Int 1998; 19:132136. Myerson MS, Corrigan J, Thompson F, Schon LC. Tendon transfer combined with calcaneal osteotomy for treatment of posterior tibial tendon insufficiency: a radiological investigation. Foot Ankle Int 1995; 16:712–718.